ALAN: Jane, you were about to tell me the story of Talli and Great Cthulhu as an example of how cats have excellent memories. My own experiences with cats suggest that they do indeed remember things very well, so I’m curious to see how your experience stacks up with mine. Jim and I went to visit my dad in Colorado, bringing with us our cat Talli. Talli was initially quite pleased with the new location, wandering around and exploring freely in company with another of our cats, Arawn. That is, until he walked into the living room, which had a very high ceiling with a fan spinning lazily at the top. Talli panicked, ran back into the kitchen, then dove under the table. Eventually, we coaxed him out, but he would not go back into the living room. What puzzled us was that he picked as his “safe place” the mud room (that’s what we call an entry room meant for taking off dirty shoes and things) off the kitchen, even though he could have gone into several other rooms without passing near Great Cthulhu. The mud room was not at all a comfortable place, but Talli stayed crouched on the threshold for hours, even though his companion cat, Arawn, had gone elsewhere and we were right there in the kitchen. Sometime later, my brother, Graydon, arrived, bringing with him his dog, Otis. Otis was not a small dog. He was a mutt with some Chow and Labrador retriever in him. Talli had only met Otis once before, when Gray had brought him along on a visit to New Mexico well over a year before. However, Talli and Otis had made friends, in part because Otis let Talli eat his kibbles. When Talli saw Otis, he left the threshold of the mud room where he’d been crouched all this time and, tail held high, made a beeline for Otis. It was evident that not only had Talli remembered Otis, he’d remembered his scent. Dad only let Otis into the mudroom of the house, so the room must have smelled strongly of him. When frightened, Talli had gone to the room that smelled like his friend. ALAN: Did Talli get over his fear of Cthulhu? JANE: Yes, in fact, he did, but only after spending some time with Otis. Who knows? Maybe Otis told him the house was safe. ALAN: I don’t want to apply human concepts to animal behaviour. It’s all too easy to fall into the trap of anthropomorphism. Nevertheless I do think that animals and humans share an understanding of some quite subtle ideas. JANE: Oh! That’s great! Many people persist in viewing animals as organic computers, with “instinct” as the guiding software. In this descriptive template, play behavior is simply training for adult roles as hunters or to run faster and jump farther. However, Cuddles is far from alone in liking to play practical jokes. Oddly enough, my story about such also involves water. Back when I was in graduate school, I’d often walk over to the Bronx Zoo during my break. One of my favorite places to go was the snow leopard to watch the kittens. This was in the day when many of the enclosures were the old-fashioned concrete floor/iron bar sort. The snow leopard’s water dish was a large steel basin bolted to the bars. On this particular day, Kitten One was busily sloshing the water in the basin back and forth with one paw – actually, he had his foreleg in, almost to the shoulder. Back and forth, back and forth, he went, spilling some water as he played, apparently unaware that his brother was carefully stalking him, using for cover the large deadfall tree that was the centerpiece of the enclosure. ALAN: Oh that’s lovely! When my cat Bess was a kitten she used to put one paw into her water bowl while she drank from it. Presumably she was holding the water in place to make sure that it didn’t run away. She still has a fascination with water and she will chase the spray from the hosepipe when Robin waters the garden. Something else I saw at a zoo has always puzzled me. The elephants at this zoo lived on an island with a deep (dry) moat all around it so that they couldn’t get off. Notices saying “Do Not Feed The Elephants” were bolted to the wall of the moat. On the day that I was there, the elephants were standing at the edge of the enclosure with their trunks dangling down into the moat. And every single elephant was standing above one of the notices, and every trunk was dangling in front of the notice, obscuring it so that it couldn’t be read. I refuse to believe that was a coincidence. But I have no idea how (or if) the animals connected the notices with the lack of treats in their life. I’d love to know exactly what it was that I was seeing there. 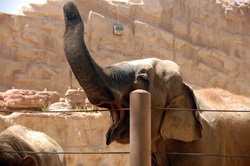 JANE: Funny… I’m not sure if elephants can read, but animals do understand language, including – or perhaps I should say, “especially” – body language. I’ve noticed this many time in my encounters with the wolves of Wild Spirit Wolf Sanctuary. One example particularly stands out. Anyhow, as we were winding down, Chris commented to Leyton, the WSWF representative, that Raven the wolf was apparently afraid of him and wondered if this might be because of his odd clothing. Leyton said, “No. He thinks you’re afraid of him, and at these events, if he thinks someone is afraid of him, he stays back.” Chris replied, “But I’m not afraid of him at all!” Leyton nodded. “Maybe not, but your body language is telling Raven differently.” Chris asked what he should do to change the message he was sending. Leyton gave him step by step instructions and Chris, who is a fine performer, immediately followed them. As soon as Chris finished adjusting his stance, Raven rose from where he’d been sitting and went over to give Chris a friendly sniff. ALAN: What did he have to alter to make Raven accept him? JANE: It’s been a lot of years, so I don’t remember precisely, but I know one element was how he was holding his arms. ALAN: My dog Jake is very sensitive to body language – and the position of my arms seems to be particularly important in getting messages across to him. If I point fiercely (yes, it can be done) he knows that he has to stop what he’s doing and go where I’m pointing. I don’t have to say a word, the body language does it all. JANE: That’s neat. My cats also understand a fairly wide variety of gestures. We’re fairly certain that they also know each other’s names, since they respond to their own, but not to someone else’s. Well, with the exception of Kwahe’e… He’ll come to someone else’s name if he thinks he can poach their food. We probably could go on telling each other animal stories forever, but let’s stop here and see what our readers can tell us about their experiences with Earth’s other people – the animals. This entry was posted on October 22, 2015 at 1:00 am and is filed under Thursday Tangents. You can follow any responses to this entry through the RSS 2.0 feed. You can leave a response, or trackback from your own site. Interesting you mentioned scent in the Great Cthulhu anecdote, since both of my favourite dog stories revolve around scent. Many years ago, when my brother was born, the day he was brought home from the hospital we were all sitting in the living room. My mother was sitting on one side of the room, and my grandmother was sitting on the opposite end of the room holding her new grandson. Our poor dog spent an hour running back and forth between them barking her “I am seriously confused/concerned/puzzled” bark – my brother must not have developed his own scent yet, and our dog thought my mother was sitting in two places at the same time. More recently my wife and I visited my parents for the first time since they’d gotten a new dog, and they warned us before we arrived that their dog (who was still just a puppy) had the habit of jumping on new arrivals and giving them a through sniff inspection, so they had him on the leash when we got to the door, expecting the usual “strangers in my territory” reaction from him. Instead he calmly walked over, gave us both a quick sniff hello, and wandered off to have a nap – presumably I smell enough like my parents, and through proximity my wife smells enough like me, that he was able to instantly identify us a members of his pack he hadn’t previously met. You know, I increasingly wonder about the “problem with anthropomorphism,” because I suspect we’re throwing the baby out with the bath-water. Yes, it’s a mistake to think that animals are human. However, we generally try to forget that humans are mammals. We’re not a separate creation, and we share large parts of our brain anatomy with other mammals. Certainly they have different sensoria, signals, sociability, triggers, and manners, but why do we assume that we don’t share the same neurons and emotions, even a sense of humor? There’s ample evidence to the contrary, especially when we work with domesticated animals and their relatives, species that have learned our signals. Animals can be fascinating! I’m spending a lot of time watching White-crowned Sparrows competing for dominance at my bird feeder lately. I’ve got a cool zoo animal story about the gibbons at the Hogle Zoo in Salt Lake City, from maybe a decade ago. Their enclosure had large plexiglas windows along on side. The male gibbon would wait up at the top of their climbing tree until there was a group of people in front of a specific point at the window. Then he would swing from the tree to another branch to a rope and suddenly smack into the window right in front of the people. He especially seemed to like doing it to teenage girls. I laughed every time he made someone jump and scream. He obviously was having fun, too. I also saw a river otter at the Portland, OR zoo, who had a swimming pool with a clear side. He(?) would swim back and forth looking for little children. When he found one, he’d start doing these incredibly tight vertical loop-de-loops in the water, right in front of the kid. I think he just liked seeing kids laugh. So many animal stories, but this was the most recent: I was at the Beijing Zoo a few months ago where two interesting things happened. 1. At one of the wolf cages, I relaxed my posture so it was non-threatening and spoke soothingly, and a wolf came over to the metal vent to sniff my hand (vent holes were too small even for a baby’s finger, but carried air just fine). One of the other zoo patrons gaped at me becuse of the wolf’s reaction. 2. On my way out, a small ape of species homo sapiens coudn’t stop staring at me. I found out later than many visitors to Beijing live in places where Westerners never go and so Westerners are sometimes far more exotic than any animal in a zoo. It’s all about perspective. As I live in a small (by Chinese standards – only a couple of million people) city in a neighbourhood that doesn’t see much laowei (Mandarin for “gringo” more or less) presence, I can definitely attest to your second point. I used to have a 20-gallon fish tank, and my cat delighted in charging the tank and jumping to hit it with her front feet, so as to startle the fish. She also enjoyed napping on the tank hood, for (so I speculated) the heat from the built-in light bulb. Then one day, I noticed this weird movement in the tank, and realized that while to my view, my cat was in her bread-basket pose on the hood, her off-front leg was actually extended down through the hood vent, in the water of the tank. And she was sweeping her paw back and forth in the water, fishing for a nibble. It still amuses me that my cat knew she shouldn’t be obvious in her fishing activities. Luckily she never caught anything – at least not to keep it. These are GREAT stories. I can’t even choose a favorite. Keep them coming!!! I have a zoo story. It happened a few years ago at the Albuquerque zoo. I was there with Mike McCommas and we got there at about 3 pm. I went into the gift shop first because I knew we would be leaving at closing time and suspected the shop would be closed by then. I bought a small stuffed animal and it was placed into a paper bag. We roamed through the zoo and got to the big cats area. I looked over the rail down into the tiger exhibit. I rustled the paper bag in the process. One of the tigers heard it and looked right at me!! I walked to one side of the exhibit and he followed me. I then walked back and forth and he kept stalking me! When I stopped he paced forward and under the “stone” ledge directly below me. It was fascinating and scary. I knew if I had been within his range I probably would have been lunch! !